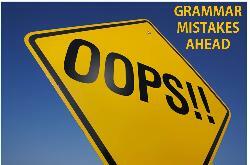 March 4 is National Grammar Day. Isn't that fun? At the very least, you'll have to admit that grammar can be funny. Read the children's illustrated version of "Eats, Shoots & Leaves"
Grammar can also be frustrating, which is why I'm sharing some common errors with you. A lot of people use the words "use" and "utilize" interchangeably. However, "use" and "utilize" do not mean the same thing. "Utilize" means using something as it was not originally intended. For instance, you could "utilize" a dime as a screwdriver or a hard-soled shoe as a hammer, although you would probably prefer to "use" an actual screwdriver or hammer since they are right tool for the job. Similarly, "continuous" and "continual" are not synonyms. They are both adjectives, and they both describe a period of time. Here's the distinction: if something is "continuous," then it has no interruptions. None. So, the radio station that says they play "Continuous Soft Rock" is wrong. News, commercials and even the promotions for "Continuous Soft Rock" all interrupt the music, so it's not "continuous." Like the previous example, "alternate" and "alternative" are easily - and often - confused. For instance, when reporting a traffic jam, a newscaster may recommend that drivers look for "alternate" routes. Long story short, taking an "alternate" route isn't wrong, but taking an "alternative" route would definitely be right. "Impactful" is one of those words that has been used (ahem, misused!) so much that it has become widely accepted - even though it doesn't appear in most dictionaries. People use it to mean "having a lot of impact." The next time you're talking about something that is "full of impact," consider using an alternative word, like "meaningful," "effective" or "influential." If you ever have a question, just ask Grammar Girl at QuickAndDirtyTips.com. Grammar Girl dispels all the myths, and the website is a great resource for all of your questions about grammar, punctuation and word usage. The lessons are easy to understand, and the archive is a grammatical treasure trove. Send me a message tell me if you'll stop "utilizing" that word (except, of course, when it's the right word to use!). Remember, there's more to grant writing than just "writing." A careful review of your grant proposals is the last step before submission. Check out this month's tips to improve your grammar and eliminate the jargon in your writing. Everything you write will be better when you follow these simple tips.